Extend the Life of you Hydraulic Elevator System! 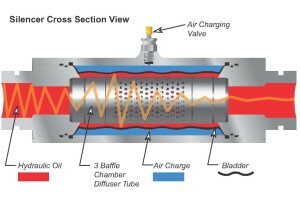 Pump pulsations cause vibrations. 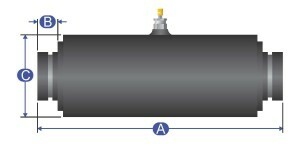 Transmitted by the piping throughout the system, vibrations cause noise, leakage and early component failure. When the Silencer stops the pulsations, it stops the source of the vibrations. This improves system performance and reduces service calls, pleasing your client and improving your reputation. Hydraulic pulsations (noise) enter the silencer and go through three different noise baffles or diffusers. After passing through these baffles, the pulsations then strike a rubber tube or bladder, charged with air to 35% to 50% of the hydraulic operating pressure. Hit by a pulsation, the bladder deflects slightly, reducing the size of the pulsation and therefore, the noise. 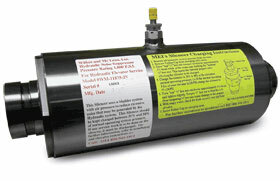 Dry or submersible hydraulic power units for all hydraulic elevator car types.